Sciatica is a condition that results when the sciatic nerve becomes irritated. Bulging discs, spinal subluxations, and muscle spasms can all cause increase pressure on the sciatic nerve. When this happens, it causes pain, numbness, and weakness in the lower back and leg. 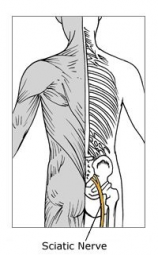 The pain may radiate from the back or buttocks all the way Xthe sciatic nerve – the longest nerve in the body. When vertebrae in the low back become compressed, the sciatic nerve roots can become pinched or irritated which leads to the pain. If left untreated, the condition may worsen and make daily tasks more difficult or impossible. It can also cause the nerve to become permanently injured. Some of the causes of sciatica include: subluxations/misalignments from pregnancy or trauma, or disc injuries from poor posture or accidents. Whatever the cause, Dr. Rob Cartwright in Fairfield can help you identify the source of your sciatica and the most suitable approach to treatment. If you are experiencing symptoms of sciatica, all our office today to start feeling better soon.